Beautiful simple lines are part of the elegance of this Confirmation cross. 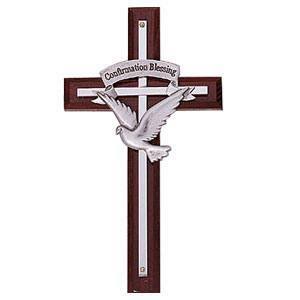 Made in the USA, this piece begins with a 7 inch cherry wood cross. On top of that is a polished silver metal cross. Finally, completing the cross is a detailed pewter dove with clean lines and a banner above it reading " Confirmation Blessing." This cross comes in a gift box.